With a woody taste of nuts or hazelnuts, freshly ground flax seed sprinkles from a Peugeot mill can embellish all dishes with smooth and balanced aromas. Recognised since antiquity for their nutritional qualities and inimitable taste, flax seeds can only be absorbed by the body in its ground form. However, when thus prepared, they can quickly oxidise and lose their flavor. This is why Peugeot designed a flax seed mill that comes with a 5-gram measuring spoon, so that only the desired quantity is ground. Strong and original, it is especially suitable for these exceptional seeds, for the hardness of their outer shell and for the preservation of their so-subtle flavour when they are finely ground or roughly chopped. This mill is also very efficient for grinding to grind sesame seeds. Presented in a box the Peugeot flax seed mill combines technicality and aesthetics. 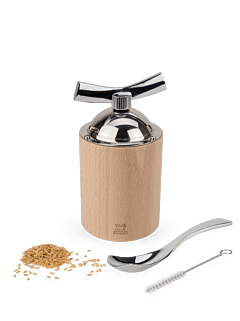 The body is carved from beech wood from local French forests and the stainless steel head mounted with an elegant handle operates the unprecedented patented mechanism, completely removable and easy to clean. An object of excellence for exceptional seeds, designed to grind them with a motion full of the charm of yesteryear and home-made flavours, which is the very definition of the French Art de Vivre.